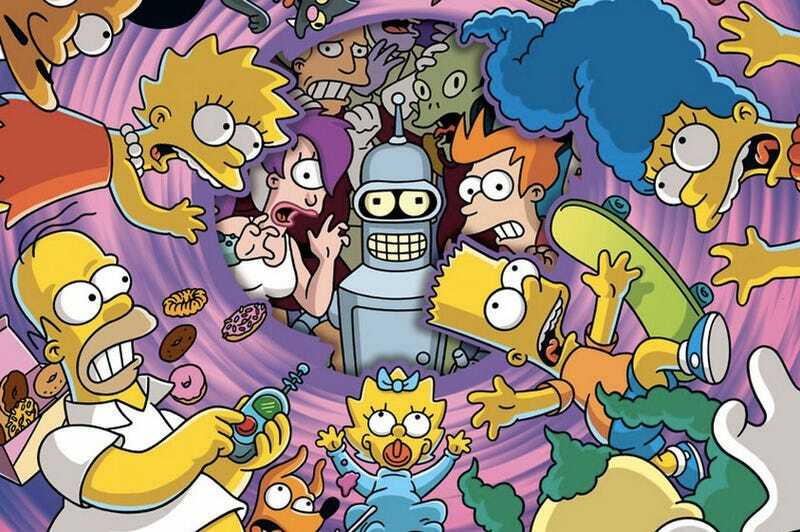 Lots of good Simpsons news came tumbling out of the TCAs this weekend, including details about a Futurama and Simpsons crossover episode, new guest cameos and clues as to which Simpsons character will die this season. The Wrap is reporting from the TCAs that this November the Futurama voice cast of Billy West, John DiMaggio, Katey Sagal, Maurice LaMarche, Phil LaMarr, Lauren Tom and Tress MacNeille will all return for a very special crossover episode. Oh man, we cannot wait. No details on whether The Simpsons would be headed to the future world,or if the Planet Express crew would be traveling back in time, but my money is on the Futurama folks hanging around in modern-day Springfield. Fingers crossed for a Homer and Bender fistfight followed by drunken buddy hang. Also (spoiler alert) one character will die this year, and although no one would reveal who, the episode that includes the death is titled "Clown in the Dumps." So take what you will from that. Finally this year's list of special guest cameos will include David Hyde Pierce, Sarah Silverman and Nick Offerman. Really hoping this means the return of Sideshow Bob's brother Cecil!